The villa is set in a tiny hillside village, just outside the medieval Tuscan town of Bagnone, with wooded walks, rock pools, a well-rated small restaurant, and church bells that chime Ave Maria at dinnertime. Guests describe the villa as “spacious”, “comfortable”, “lovingly restored”. They highlight the well-equipped kitchen, the spectacular views, the extra amenities –free wifi, books, maps, DVDs, games, fresh herbs and salads, private parking. The secluded 11x4m solar-heated salt-water pool is warm from June to September, with sun loungers, fully-equipped changing and shower-rooms, and a covered terrace with outdoor kitchen and dining facilities including sink fridge, tableware, large Weber gas BBQ, and table tennis. The pool is set in extensive landscaped gardens with views over wooded valleys to Bagnone castle and the mountains beyond, with many different spots to relax comfortably in sunshine or shade. Guests say they often spend whole days (and evenings – there’s gentle outdoor lighting) just lazing in the gardens and the pool, maybe with a wander down to Bagnone for a coffee or some shopping. Guests also say the villa makes an excellent base for sightseeing: the Cinque Terre and Italian Riviera are under an hour away, and Lucca, Pisa, Florence Parma, Genoa are all easy days out by train or car. We provide extensiveHouse Books on the property, the area, local highlights and specialties. This a wonderful area for food and drink, with many great places to eat - including Al Vecchio Podere, the delightful traditional farm restaurant across the square. We are always on hand, via email, phone or WhatsApp, to help with advice and bookings if needed. The villa is priced for families or couples (up to four people) with two double bedrooms and two well-appointed bathrooms, two sitting rooms, and a traditional Tuscan kitchen and dining room. The inter-connected ground-floor apartment, with kitchen, sitting/dining area, bedroom and bathroom, can be added for up to two more guests. The extra space, privacy and facilities are particularly appreciated by multi-generation families holidaying together. We’ve rented the villa to 75 families for over 125 weeks, both direct and through online booking sites. We're new to HomeAway, but have multiple 5* reviews on another site! You can find all our reviews (from which we've taken captions for the photos on this site) on our own website - simply search for Al Palazz Bagnone to learn more about holidaying here. We’re always happy to answer questions: we want guests to have a wonderful time staying here. For us, Al Palazz is a relaxing rural retreat that offers a real taste of Italian life. If that is what you’re looking for, please do be our guests. We fell in love with Italian cities in the 1990s, and wanted to get to know Italy better. We chanced on Lunigiana and three summers later fell in love with a 14th century ruin! The villa is now fully restored and the gardens and pool are entirely new. We've rented holiday homes ourselves for 35 years, and offer at Al Palazz those things we appreciate ourselves as renters, as well as things we know our guests like - we've rented Al Palazz to 75 families so far, so we're experienced hosts! Now we’re retired we spend a lot of time here and have many good friends locally. This is most relaxing place we know, perfect for gatherings of our global family, and a wonderful spot to develop our gardening skills! This for us is 'real Italy' - a historic villa that's part of a thriving tiny village, with local shops and restaurants close by, in a traditional rural area. The slow pace of life here is a complete contrast to our life in a modern city in England. We love the views, the light, the air, the changing colours of the hillsides. We love being ‘away from it all’, relaxing looking out at the view from the sitting room, in the gardens or by the pool. We love pottering around local towns, days out at the seaside, visiting Florence and Parma, walking in the hills, dipping in mountain streams. And we especially enjoy cooking and eating out! The villa is a relaxing rural retreat. It’s spacious, comfortable and well-equipped, close to all facilities but away from it all. You can laze all day and evening by the secluded pool, or explore the many delights of the local area. The villa is also a great base for sight-seeing: the Cinque Terre and major must-see cities are easily accessible by train or car. Our prices are flexible so that Al Palazz can be a romantic retreat, a family holiday house, or a place to share with friends. Our House Books are a mine of information on the property, the area, and local food/drink, and we're always on hand, by email, phone or WhatsApp, to help with queries, advice or bookings. We know the best places to go and best things to do, and if in doubt we know who to ask among our many Italian friends and contacts! Bathroom 1: whirlpool bath, shower, bidet, basin, WC, shaver point, heated towel rail. Bathroom 2: shower, bidet, WC, basin, shaver point, heated rail. Bathroom 3: (in ground floor apartment La Cantina ) shower, bidet, WC, basin, shaver point, heated rail. Modern fittings in fully-tiled bathrooms with terracotta floors. This area, Lunigiana, is a little-known corner of rural Tuscany, with castles, hills, valleys and streams, enchanting medieval towns and villages - yet in easy reach of all the major Tuscan sights. The village is quickly accessible from the A15 motorway, and from three local stations. And it's an easy 1.5km walk or drive to Bagnone, named in 2011 as one of the prettiest little towns in Italy. Landline available for use on an honesty basis. Full gas central heating is available (though never needed in summer). Weekly change of sheets. Duvets and/or light bedcovers provided according to season. In the square directly outside the villa and also in our private car parking area 100m from the villa. Wifi is free and available throughout the villa. Weekly change of house towels. Please bring your own swimming/seaside towels. Two easy to use woodburning stoves are perfect for spring/autumn evenings. Spacious comfortable sitting room with heavenly views across the valley to the castle. Plus dining area 'snug' with sofas, Italian TV, DVDs, maps, guidebooks, games and our House Books on the area. Family size with separate freezer section. Gaggia for the perfect capuccino, cafetieres and mochas. There's a full set of herbs and spices and kitchen basics like sugar and flour. Plus fresh herbs and veg in the garden and fruit on the trees. Also full cleaning materials, paper towels, etc. The kitchen is fully equipped with kit and cookbooks to enable a serious cook to make a feast! Traditional Tuscan kitchen with all modern comforts. Marble table seats six. Antique marble sink and wooden units . The kitchen opens onto a terrace for coffee/aperitivi overlooking the square. The antique poplar dining table seats six comfortably. Or dine informally at the marble-topped kitchen table. Or - as guests often do - eat out on the poolside terrace with its summer kitchen & BBQ. Italian freeview TV and radio channels available plus Internet radio with thousands of channels including all BBC. Speakers on first and second floors, plug in your own music. Extensive library of English and Italian DVDs. Extensive library of holiday reading, books in English and Italian, books set in Italy and about Italy; maps and guidebooks; cookery books. A range of board and card games for families. There’s a Clavinova in the villa, just bring your own taste in sheet music. The villa has an acre of private landscaped gardens, with orchard and salad plot. Access to the pool and gardens is just a few steps across a cobbled car-free alley or from our private car park. The gardens have three large paved terraces furnished with comfortable LaFuma recliner chairs, a swing seat, small and large dining tables and chairs , so you can catch the sun at all times of day. The villa is three-storey. There are three flights of steps in the garden, some unfenced drops, and the pool is 1.4 deep throughout, so children need supervision outdoors. Totally secluded 11m x 4m solar-heated salt pool with spectacular views. Full changing facilities, dining area & summer kitchen, and lighting, for magical evenings overlooking the stars and the pool. Towels / Linen: Weekly change of linen and bathroom towels are included in the price. Cleaning: The villa is cleaned before and after each visit. Guests are asked to leave the villa clean and tidy, particularly bathrooms and kitchens. Household supplies: The villa is well-stocked with cleaning materials and basic cooking essentials, so you don't need to worry about buying boring things like salt or detergent or dishwasher liquid. Coast/Beach: The picturesque port and beaches of Lerici are just 45 minutes/40km away. Portovenere and the Cinque Terre, tiny villages clinging to a rocky coastline, are an hour/50km away and can also be reached by train or boat. The full Italian beach experience – sun loungers, umbrellas, all facilities - can be found at Marina di Massa (about an hour) and beyond. There are also many local crystal-clear streams for paddling, dam-building and swimming locally. Full details in our detailed Out & About book. Travel: Nearest airports are Pisa (1 hour), Genoa or Parma (1.5 hours). All have car hire. You can also get here in a few hours from cities with airports and stations throughout northern and central Italy, including Bologna, Rome, Milan, Turin, Venice. Nearest stations are Aulla, Villafranca-Bagnone, Pontremoli. The villa is 20 minutes from the A15 motorway exit and railway stations. A car gets you round more easily, but guests have also managed on foot and with trains, taxis, buses. Distances: A short 1.5 km drive, or a 20-minute walk down the hill on a track through the woods, takes you to Bagnone - a lovely small town with bars, restaurants, all shops, doctors, pharmacy, post office, banks, play park. 15-30 mins driving takes you to many villages, Villafranca, historic Pontremoli and modern Aulla. There are good restaurants, excellent markets and specialist food shops. 30-60 mins lets you explore Lunigiana (see below). Pisa, Lucca, Parma are 75 mins away, Genoa 90 mins, Florence 2 hours. 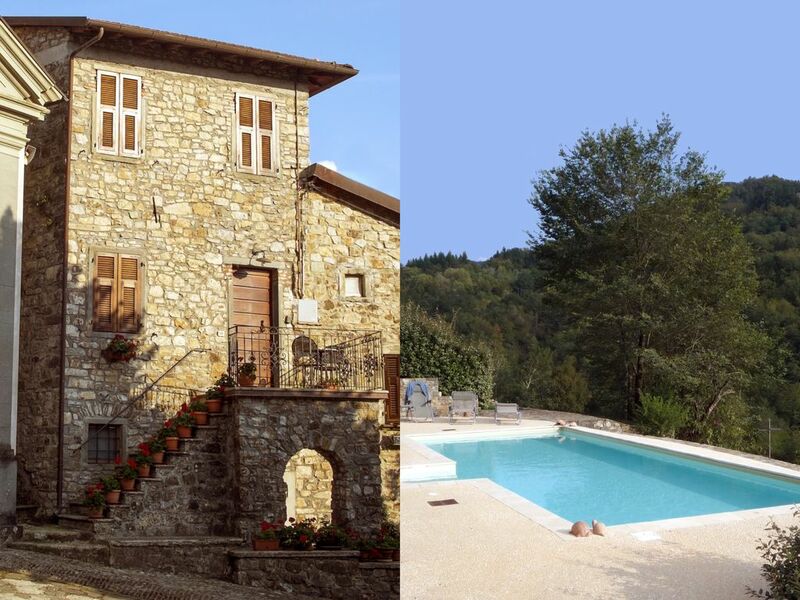 Further Details: The villa is most suitable for people looking for a relaxing holiday in 'real Italy', who will enjoy the comforts of a family home in a village with Italian neighbours and who will relish the chance to explore an unspoilt part of Tuscany with deep-rooted values, local traditions … and great food! The towns and villages of Lunigiana are small gems - wander cobbled streets and squares, historic castles, churches, houses, museums. Many guests mix days at the villa and by the pool with days in the valleys, at the seaside, in the mountains, or seeing city sights. Wherever you go, we can signpost you to things to do, places to see, and great places to eat - Parma ham, Parmesan, pecorino, chestnuts, porcini mushrooms, lamb and wild boar are just a few of many local specialities. Our detailed House Books, rated highly by guests, cover the property, the area, and eating out. We are also available by phone for queries on arrival and for any issues during your stay.